You did it – you’re half way there! Friday is just around the corner. And what a better way to award yourself than with a glass of wine and some #WeddingTipWednesday? One of the biggest conflicts we come across is budget, because, unfortunately, nothing in this world is free. We often have brides think it’s a better deal to get chargers from one company, linens from the next and lighting and draping from another. One may think they’re saving because Suzy’s shop is a few dollars less than Joe’s, but in the grand scheme of things, bride’s end up paying more trying to piece together their big day, and not to mention the big headache at the end of the day! Each company has different delivery, installation and pickup fees. Of course, we can’t forget about those famous hidden fees added on to your order as well! Plus, each company has different quality product. At the end of the day, it’s much more cost and time effective to do a one-stop shop. After being in this business for over 10 years, we cannot stress enough how important it is to review your contract. Not only will it help answer any questions you may have, but it is a great way to get all of the financial information up front and in writing! Most companies do have a non –refundable deposit, so make sure the company you’re deciding to work with is ‘the one’. At Luxe, we truly love to pride ourselves on our high level of customer service and quality of product. During consultations, we give all of our delivery and pickup fees right up front. And we have no hidden fees added to our orders! We understand how important budgeting is to brides! Per our contract, we allow a 10% drop in numbers. 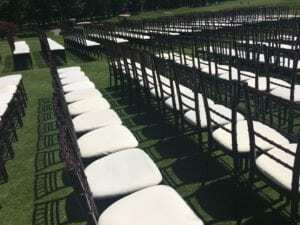 For example, if you book 200 chairs, you’ll be able to drop 20 chairs, without restocking fees. When obtaining estimates, it’s very important to factor in the 20% of guests that typically cannot attend events. When you factor this number in, you’ll be able to get a more accurate quote for your budget! So if you’re inviting 250 people, ask for quotes with a guest count of 200. Contracts also state information about missing or damaged items. It is very important to read all of this information, especially if you’re planning on having wax candles, a kids table or rough centerpieces that may snag or rip linens. As for missing items, we have had everything in the books from cousins stealing the napkin rings for their Thanksgiving dinner to groomsman’s wearing linens around as capes for the after party! With weddings, you never know what you’re going to get!